Have an idea and need some startup capital? Crowdfunding has increasingly become a way to get those initial funds or get more capital to further your strategic plans. 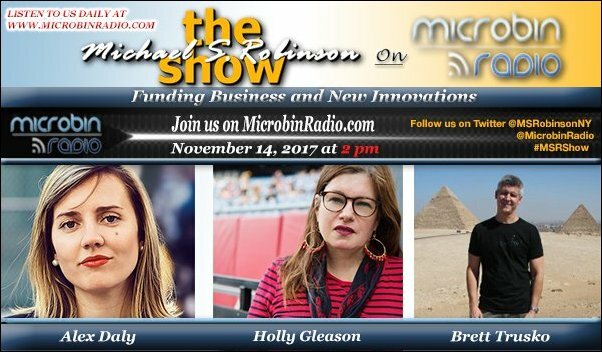 Crowdfunding consultant Alex Daly talks with Michael Robinson about the benefits of crowdfunding and shares tips and on how to make it work for you. Holly Gleason has put together a book full of personal stories from an array of woman country music artists. She talks about her book with Michael and shares how their stories can move and change your mindset and life. Innovation in business drives the economy. Small businesses coming up with new ideas and exploring different ways to solve problems help fuel the economy. Michael talks with IAOIP president Brett Truskp about what he sees the future holds and what industries may become obsolete.